Home > Introducing Bacteria > What Are Bacteria? Bacteria are single-celled organisms that live on Earth in massive numbers. Although bacteria can survive extreme environments, most flourish best in conditions that also support other living organisms. The human body is teeming with different types of bacteria. Many are friendly bacteria – they do no harm and can perform useful functions. Others can be actively harmful and are described as pathogenic bacteria. Bacterial diseases include meningitis, tetanus, cholera, pneumonia and even the plague, a deadly bacterial infection that wiped out a third of Europe’s population in medieval times. 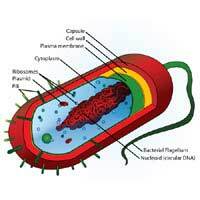 All bacterial cells have a very basic structure and are classed as prokaryotic cells. This distinguishes them from the more complex eukaryotic cells of plants and animals that have many extra internal components, including a nucleus and other tiny organelles. Each bacterium has a cell wall that encloses fluid cytoplasm. This contains the DNA and simple cell machinery that controls all bacterial functions. Most bacteria reproduce very quickly, each one splitting into two new and identical cells. In the right conditions, a bacterial population can double in just 20 minutes. Individual bacteria are too small to see with the naked eye, even with the help of a magnifying glass. A powerful electron microscope reveals the millions of bacteria that fit easily onto the head of a pin but a basic light microscope can show the shape of bacterial cells, which are either spherical (the cocci) or rod-shaped (the bacilli). Bacteria can also be classified into two main groups on the basis of their cell wall structure. A staining technique involving two dyes is used to distinguish gram positive bacteria from gram negative bacteria. These two basic identification methods have been used for many years but modern microbiology has many other techniques that can identify the exact bacterial species present in an unknown sample. These include biochemical tests that look for the presence of specific enzymes, genome studies and proteomics. Many types of bacteria that live on the skin or in the digestive system do more good than harm. Good bacteria on the skin prevent pathogenic bacteria getting enough space to start up an infection. There are 10 times as many bacteria in the human gut than there are cells in the entire human body. These friendly gut bacteria also help fend off disease-causing bacteria but they also help with food digestion, produce vitamins and help stimulate the immune system. Bacteria are also useful in the environment. They play an important role in the process of decay, which recycles valuable nutrients from dead animals and plants. Some bacteria even help deal with pollution, using toxic waste as food and converting it into harmless products. Some types of bacteria cause disease in people and in animals. To set up an infection, bacteria need to gain access to the tissues of the body. This commonly happens at the sites of entry that already exist – particularly through the mouth, and nose. This is why bacterial infections of the digestive system and lungs are common. E. coli bacteria and types of Salmonella cause many instances of food poisoning, H. pylori bacteria are known to cause stomach ulcers and one of the most frequent causes of bacterial pneumonia is the species Streptococcus pneumoniae. Cuts or grazes in the skin can also allow pathogenic bacteria to enter the body, and these can spread causing blood poisoning or tissue destruction. An extreme example of this is necrotizing fasciitis, caused by Streptococcus pyogenes, also known as flesh eating bacteria. Although cases tend to get reported in the media because they develop quickly and are often fatal, this is actually a very rare disease. More common bacterial diseases, such as the plague, cholera, tuberculosis, leprosy and anthrax, have caused epidemics that have killed millions of people in the past. Some bacterial diseases are far less common today because of the development of antibacterial drugs called antibiotics, which first became available in the 1940s. Although antibiotics have saved many lives and are still a valuable form of medicine, bacteria themselves have fought back, and many have become resistant to antibiotics. Antibiotic resistance is now a huge global problem. Hospitals all over the world are battling with methicillin-resistant Staphylococcus aureus (MRSA) and Clostridium difficile, which cause infections that are very difficult to treat. Although it might be tempting to think that a world without bacteria would be good because it would mean no bacterial disease, it would be impossible for life to continue without them. On balance, bacteria do more good than harm, not only in the human body, but also in the wider environment, and are an important part of the diversity of life on Earth. @sweety - thank you - glad you find it useful! this is brilliant website, give good information,thanks! This is a great website! Lots of information, but still super easy to read. Thanks! I love this websie its soooo cool! i get all my ideas for tests here!